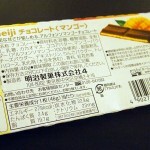 Review: Meiji Mango Chocolate | Oyatsu Break! 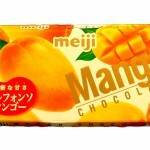 Continuing with the wonderful Japanese snacks gifted to me by Deb Aoki this year, comes the a brand new Meiji chocolate bar–mango! It’s chocolate and mango! Together at last! Err….? I’ve never had a Meiji Chocolate Bar before–they’re like Hershey’s in Japan due to their ubiquitous nature and consumer-grade products, but then as I’ve said previously, I’m not really that into chocolate in general and none of the flavours had been that… compelling. But I know I’d be pretty excited about a mango/chocolate Kit Kat, so my anticipation for this Meiji bar certainly is higher than normal. Let’s dive in! Packaging: Ritz-zy! Gold ink, full colour wrap-around packaging, cardboard box, foil wrapping inside. All kinds of perforations! Lovely. Kind of surprising that there’s no visual depictions of chocolate on the outside of the package though, which for me is a staple of Japanese package design. 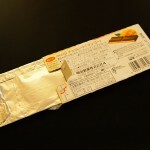 Maybe Meiji chocolate bars are just so de rigeur in Japan that everyone knows what they’re getting? Seems like a weird oversight. 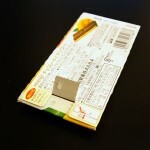 I also like the little instructions of how to open the box, pulling tabs and sliding flaps. 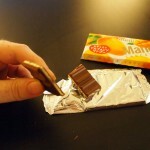 It’s exactly the amount of over-the-top I want in my candy bar packaging. Scent: Going back to the packaging for a sec, cracking open the foil and the chocolate is so soft! Like, melt-in-your-mouth (not to mention your hands) soft. Anyway, while I didn’t get bowled over by the intense scent of the chocolate like I have with some of my Kit Kat tastings, a closer sniff-test revealed that the chocolate mostly just smelled sweet. A little bit of sweet milk chocolate, with a lot of sweet, candy-like mango flavour. 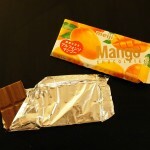 The Meiji Mango Chocolate bar is a fruit-flavoured white chocolate mixture, sandwiched between two layers of meiji chocolate, in a fairly large bar. The outer chocolate coating has that slightly waxy/plastic taste that you find in most commercial milk chocolates, that I can somehow bring myself to overlook on Kit Kats… maybe they’re using better chocolate? 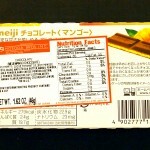 Either way, tasting just the Meiji chocolate it’s really unremarkable without much of a strong flavour. But when you take a bite of the whole bar…? Yowza! 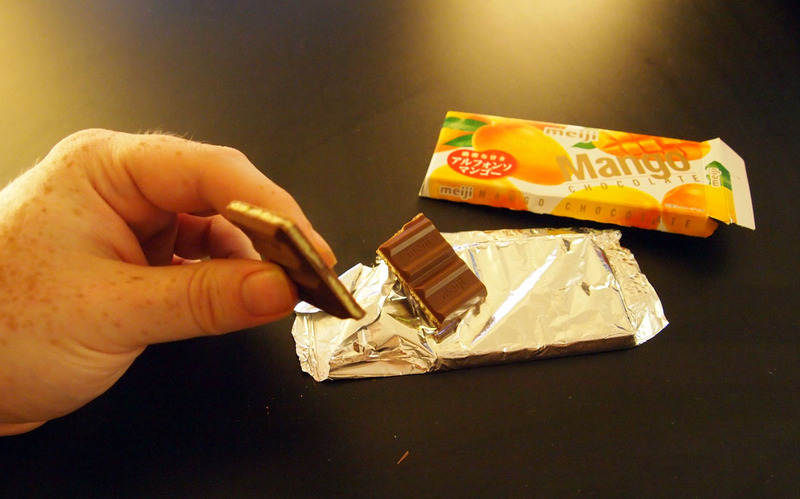 The mango taste really comes through, and the chocolate is actually a nice companion to it. The mango taste is very big, though not very ’round’, which is to say it’s a one-note mango taste, not like eating a piece of fresh mango which has a richer, full-mouth flavour. Still though, they got the essence of it down, and their sort-of bland chocolate matches nicely, surprisingly. I did wonder whether a stronger (or darker) chocolate might have been a better match, but maybe, as my husband feels, the best way to mix chocolate and fruit is to just tone down the chocolate flavour all the way.